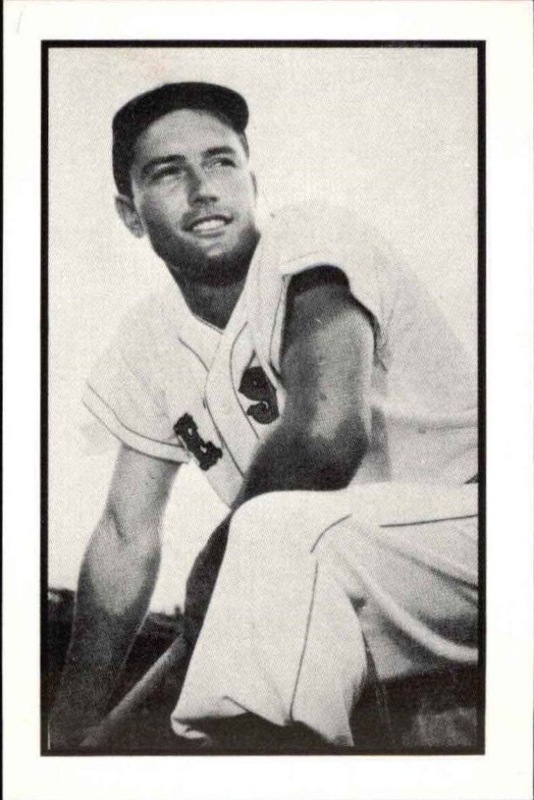 Early this morning, the baseball world woke up to the news that former Red Sox star, Jimmy Piersall, had passed away at the age of 87. As of now, no cause of death has been released to the public; but, it has been reported that the Major Leaguer had been suffering from a month-long illness, while being confined to a health care facility in nearby Wheaton, IL. Piersall, of course, is best remembered for his battles with mental illness, a struggle that was documented in the Hollywood film, Fear Strikes Out, which starred a young Anthony Hopkins as the embattled outfielder during his rise to the Major Leagues. The rookie's antics gave fans and critics alike plenty of entertainment and column-fuel; however, as the 1952 season progressed, the mercurial player became more and more unhinged - he engaged in fisticuffs with his own teammates, make pig noises at Satchel Paige, sobbed upon seeing his name taken out of the starting lineup, and got into legendary dust-ups with umpires. The public ate these "eccentricities" up, but Piersall was sick and the Red Sox could not handle him anymore. After playing in 56 games during that 1952 campaign, Piersall eventually broke down and was admitted into a mental hospital to undergo treatment for bipolar disorder - a condition which was little understood, at the time. His breaking point was nowhere near as dramatic as it was portrayed in the Hollywood interpretation, but his wife knew that enough was enough. Courtesy of her care and love, medical treatment, and the support of his friends, Jimmy was able to get himself back on track and learn how to deal with his condition. 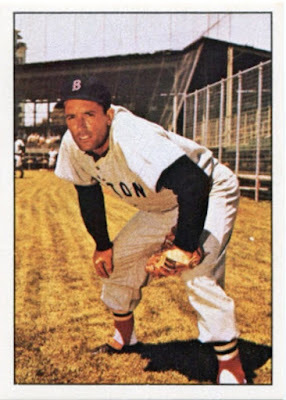 By the time the next season started, Piersall was back in the starting lineup, patrolling the outfield in Fenway Park. The temperamental and mercurial didn't stop being himself, however. During the course of his 17-year career with the Sawx, Indians, Senators, Mets, and Angels, Jimmy kept everyone in the game on their toes. He was once ejected from a game for running around and waving his arms in center field to distract Ted Williams at the plate, arrested after going into the stands to confront a heckling fan and, perhaps most infamously, backpedaled around the bases after hitting his 100th career home run. Jimmy Piersall was always going to be Jimmy Piersall. 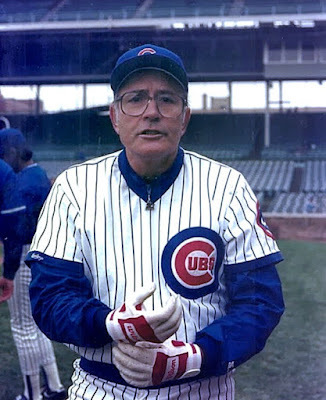 After his time on the diamond came to an end, Piersall took his wild antics up to the broadcasters booth with the Chicago White Sox, where he worked with future Cubs icon, Harry Caray, from 1977-81. While wildly entertaining behind the microphone, the eccentric partnership came to an abrupt end after Piersall became openly critical of the manager Tony LaRussa and his players. Piersall always did say whatever was on his mind. Of course, you probably knew all of that already. But, did you know that after that stint, Jimmy took his talents to the other side of Chicago to serve as an outfielder's coach, hitting coach, and a roving minor league instructor for the Cubs? Jimmy was hired by Dallas Green in 1986 to the Cubs spring coaching staff to provide some instruction to the Cubs outfield corps. Upon his hiring, the controversial and gruff Piersall commented, "Tell them not to bring their golf clubs. We plan to do a lot of work." For the next fourteen seasons, Piersall did just that, instructing young, would-be Cubs prospects in the arts of fielding and hitting. Then, after manager Jim Riggleman was fired at the conclusion of the 1999 season, Piersall took to the radio airwaves to criticize the move, implying that the front office staff should have been let go before him. At that point, Piersall joined Riggleman on the chopping block. As you can see, Jimmy simply never stopped being Jimmy. 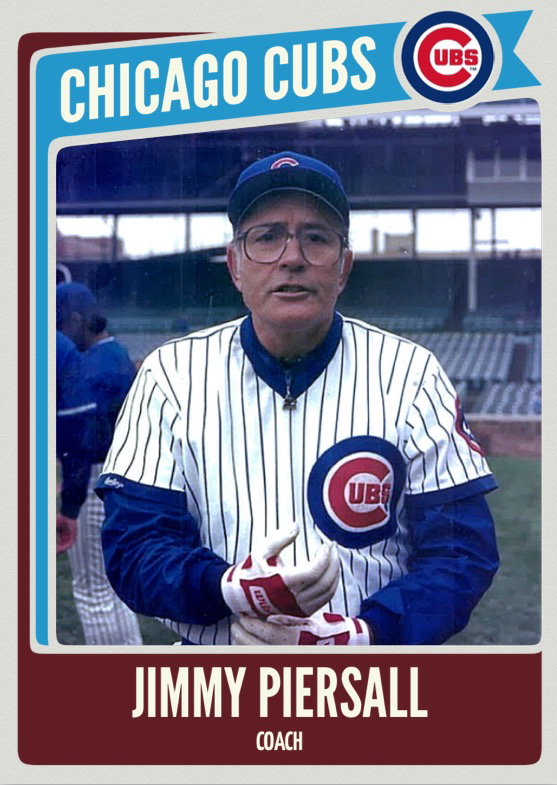 Courtesy of the Rookies App, here is my interpretation of a Jimmy Piersall Cubs card . 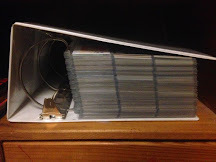 Maybe someday I'll actually design my own and print it out on real cardstock; but, for now, this .jpg creation will do. In summation, today we must honor the memory of a man who never let the stigma of mental illness keep him from reaching his potential - a stigma which unjustly still exists today. Piersall served as an inspiration to the millions of Americans struggling through that same daily battle throughout the country and, for that, he was a hero which transcended baseball and sport. Ah, that's too bad, I hadn't heard. Thanks for posting it and great work on that custom. Rest in peace Mr. Piersall. A long time ago I read his autobiography "Fear Strikes Out". It's truly amazing he was able to get the help he needed and continue his career. R.I.P.